Last Thursday we played Borderlands and its DLC for our monthly Xbox Live Co-Op Night. We were lucky enough to be joined by Mikey Neumann, Creative Director at Gearbox Software. Throughout the night we invited members of the community in to join our romp through Pandora as we took on Claptraps, Midgets, and plenty of other baddies. If you didn't know, Mikey does the voice of Scooter in the game, so he thought it'd be a good idea to record the sessions just in case he decided to break out into voice. So with the cameras rolling, capturing about 3 hours of footage, I compiled a little "highlight clip" of some of the conversations that went on. Remember, a lot of this is out of context with chats from myself, Mikey, our news Editor Andrew, and random internet folk. There were plenty of discussions to be had about game design, user submissions for games, what its like to work at Gearbox - and of course - how Gearbox is the savior of all doomed franchises. 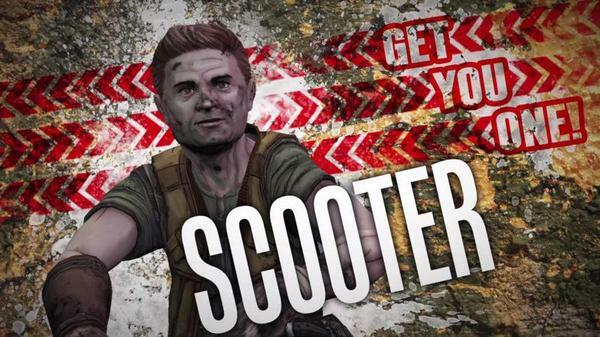 And yes, Scooter does make an appearance to talk about his DLC...that never was. We're giving away each piece of DLC for the Xbox 360. To win is simple - all you need to do is leave a comment below and tell us which episode you want - Mad Moxxi's Underdome Riot, The Zombie Island of Dr. Ned, The Secret Armory of General Knoxx, or Claptrap's New Robot Revolution. Bonus points for giving us your favorite moment from the video above. Winners will be drawn on Wednesday, October 20th.